Well, I’ve had the iPad now for almost two months and disaster has struck. Apple have finally started shipping in the UK, so now everyone will have one. To be fair, they remain in short supply, so maybe I can still feel a little smug for a while longer. On the plus side, Apple are now allowing us foreigners to buy their iWork apps. I’ve no idea why they restricted sales until now to US registered iTunes accounts. It’s not like you can run out of download copies. 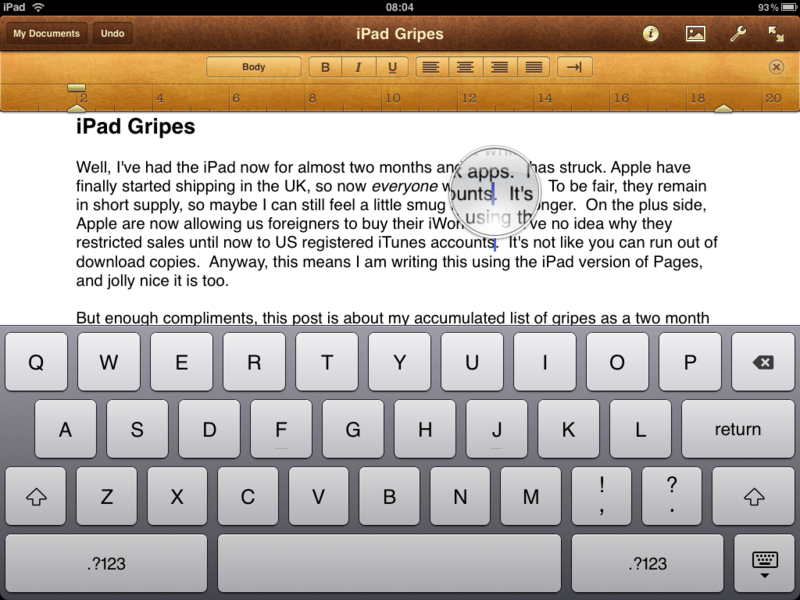 Anyway, this means I am writing this using the iPad version of Pages, and jolly nice it is too. 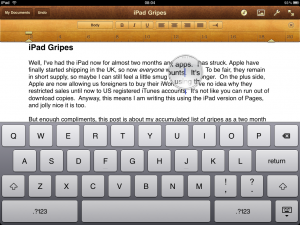 But enough compliments, this post is about my complaints – my accumulated list of gripes as a two month veteran iPadder. I’m not going to rant about the over-reflective screen, the greasy fingerprint challenge, the lack of flash or the convoluted workflow to get documents on or off the device. These have been much discussed elsewhere. No, it’s the little annoyances that I need to get off my chest. The iPad equivalents of the paper cuts and gnat bites that irritate and annoy out of all proportion to their seriousness. Top of the list is the lack of cursor keys on the virtual keyboard. Positioning the cursor in a block of text by tapping with your finger works surprisingly well and the magnifying glass feature helps get to the precise spot. But when fat fingers have made you miss your mark by one character, having left and right cursor keys would be so much simpler and quicker. Likewise, when you need to go back and correct something you just typed, having a non-destructive alternative to the backspace key would be great. The OS obviously supports it, because it works when I connect my Apple Bluetooth keyboard. Maybe adding two more virtual keys would have been too expensive…. Next gripe is the auto capitalisation feature. Yes, I know you can turn it off. And I have. The problem is that it is actually very useful and I wish I could leave it on. But it is just slightly too stupid. Why exactly it thinks that capitalising the first letter of an email address when filling in a web form is the right thing to do is beyond me. I’ve also been experiencing random application crashes, maybe once or twice a day. Playing video sometimes results in a complete system freeze, from which the only escape is a full restart. Whether this is the fault of the iPad or the app developer’s coding is hard to say. But it does somewhat dilute the device’s credentials as an easy to use alternative to a laptop for less sophisticated users. Overall though, this is a remarkably impressive machine for version 1.0. The most telling verdict is that it has rarely left my side. Here’s hoping that the next OS upgrade will sort out the remaining annoyances and bugs.